I was in London last week speaking at the Contensis Autumn user groups. As the groups came to a close, we ended the afternoon with some 3 minute lightning talks. I hadn’t come prepared to do a lightning talk, but the last 24 hours in London had set me up with enough material. As the title of the post suggests my 180 second ‘thought shower’ stemmed from small user experience changes since my last visit to the big smoke. For those who spend time in larger cities regularly the items I’ve outlined may not seem unusual, but for an outsider made the world of difference. I don’t travel to London very often but when I do I use the underground a lot and like most ‘tourists’ I can never remember what stations or lines to take. I used to use an app called Tube Deluxe, but it wasn’t installed on my phone. I pulled up the TFL website and used their route finder to get me from Paddington to Tottenham Hale. It clearly outlined the lines I needed all from a responsive site. 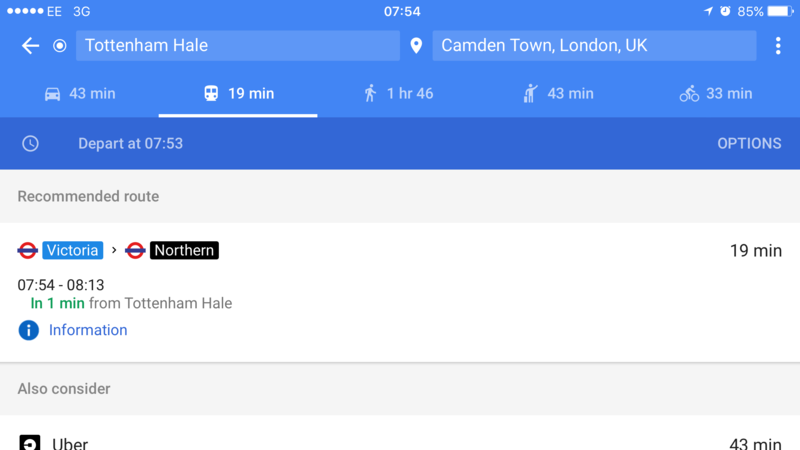 However a little delighter for me was when orienting my phone in to Landscape some additional journey information was displayed, highlighting duration and what stations I had to change at, a simple interaction and a side effect of a responsive layout. Having left Newport station and taking the long route around Gloucester to Paddington, I realised I’d left my Oyster card in the office. Its not a huge issue I’ll buy a ticket when I get there, only trouble is I never know which lines I’m going to be on or how many trips I’ll be doing, it seemed like a faff. I looked through the app store to find a multitude of Oyster apps, most of them providing a way to check balances, or top up a card but nothing about using the app to pay. It was only then I remembered the launch of Apple Pay that the transport of London has signed up to fully support payment across their services. As I approached the Bakerloo line from Paddington, a quick tap of my phone as I entered the turnstile gave me access to the underground, staggering. That familiar voice on the tube calls out the next station preparing you to leave the sardine can on rails, the daily commuters almost seem oblivious to the announcement. Such a minor item, but it enabled a shift in the carriage before arriving at the station, it allowed you to relax more without worrying if you had to barge your way past everyone in a rush. Another delighter. I’m not sure when this change was introduced but for an irregular user of the tube it made the world of difference to my journey at the peak time using the tube. I’ve been using Google Maps since it was first launched, and you’re never aware of all the little features until someone points them out to you. 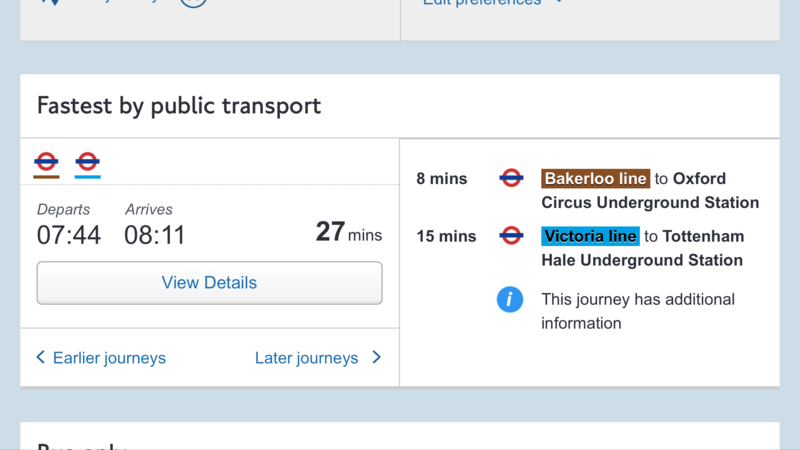 Having used the TFL website on the first morning, my colleague pointed out the Google Maps now supported Tube journeys with similar behaviour to the TFL website. So whilst I could continue to use the TFL site, I’m regularly in Google Maps which provided me a more contextual experience. Having spent just over 24 hours in London, I made my way home to Newport. It had been an enjoyable and fruitful day with Contensis users, but I was looking forward to getting home. Its about a 20 minute walk from the station home, and on this occasion I wanted to jump into a taxi and be transported to my bed, only thing is I never carry cash! Only a few days earlier I’d seen a Newspaper stand announcing “app taxi firm comes to Newport” surely it could only have meant UBER. I quickly downloaded the app, signed in and hailed a cab outside Newport station, a few minutes later I was home having paid for the taxi using my PayPal account. So whilst I don’t travel a lot each of these micro iterations was improved with iterative changes to the user experience and made it a delight to use technology.